We see you over there making big moves in your business. You’re crystal clear on what you do and who you do it for. You’re confident that the work you do matters. We’ve convinced you that you still need a blog and you have your blogging content calendar planned. But what about all that other content on your blog? You have incredible posts that you’d love to repurpose and you know that if you got them into the hands of the right people it would make your business grow by leaps and bounds. 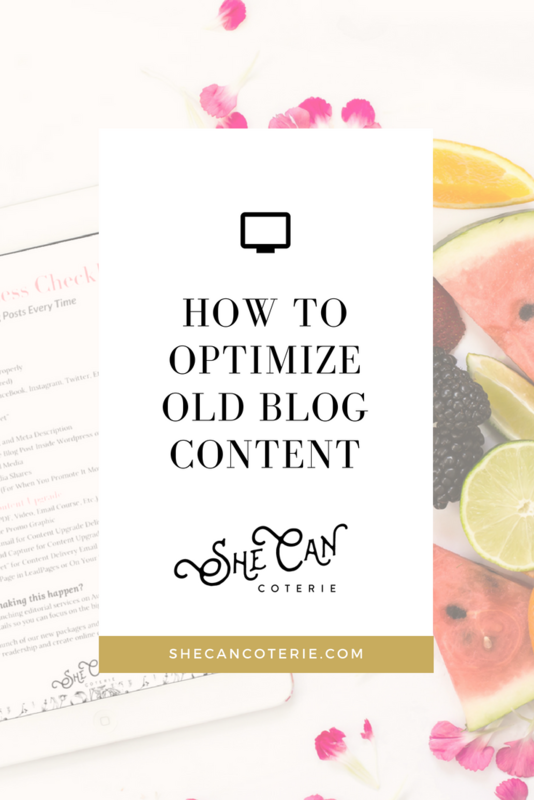 Here’s the thing: updating your old content can increase your pageviews if you’re strategic about it. More pageviews means more eyes on your product or service and more eyes on what you’re selling means more potential clients. Instead of letting those past posts just sit in blog purgatory, make them work for you! Update titles to make them more SEO-friendly. SEO stands for “search engine optimization” and is the process of getting traffic to your site from search engines. We could talk about SEO all day, but if you update your blog post title to include keywords that Google likes, you will get higher priority on search engine results. There are plenty of websites out there that can help you research what keywords are best! Update the formatting to improve readability. By making your post easier on the eyes, people are more likely to stay on your site. Break up longer sections of text into smaller, bite-sized paragraphs. Utilize headings and try bolding important information. Use lists. Make sure that everything is visually top-notch. Update any timely content and make it evergreen. Or delete those posts altogether if they aren’t relevant anymore! There’s no shame in that. You don’t want your customers wading through posts about your new puppy or an outfit from 2013 if you want to be serious about your biz. In our post about your blogging content calendar, we talk about narrowing your topics down to around five categories. That way, your content is focused and streamlined. Check all links to make sure they aren’t broken. If you’re optimizing a post from years ago, chances are the links you provided have a new home on the internet and they’ll need to be updated. We like to use the free website BrokenLinkCheck.com to do this quickly. BONUS TIP: Speaking of links, you should always be doing what is called “deep linking,” which is when you link to other content of yours within each blog post. This helps your readers find other content they are interested in and keeps them on your site longer. It’s a win-win! TWEET THIS: "Have you thought about optimizing your old blog content? It can make a huge difference for your biz!" You probably have created some killer opt-ins since you started blogging that would be relevant in your old content. Get those added to old posts so you can make them do some work for you! Update graphics to match current branding. Chances are, you’ve rebranded at least once since starting your blog and biz. Make sure all your graphics reflect that so you are consistent across the board. It’s a good idea to make them Pinterest-friendly too! Add to your Pinterest schedule and group boards. Pinterest is an epic visual search engine that can bring your content to the next level by connecting you with your dream audience. Why wouldn’t you want to utilize it? BONUS TIP: Hiring a Pinterest manager can make all the difference for your biz. Let us help you! Make sure you are adding optimized content to your social media sharing schedule. Get some tweets written and some Facebook posts created so that you are getting eyes on your newly polished content! Do some brainstorming while you’re optimizing. Could old blog posts be repurposed into a email course, ebook, or other content upgrade? Probably! Get those creative juices flowing. If you take this nine suggestions to heart and take the time to make them happen, you’ll see changes on your blog. Set aside some time each day to make your way through your old content and it’ll make a big difference! If that isn’t your jam, but you know that you have old content that can bring you new customers, we have a content optimization package and a team that would love to help you. Schedule a call with our content manager today to find out more! Before you go, we have a free, 17-step checklist that will make every blog post you write shine. Get your checklist below and get writing that awesome content, boss babe!